Professor at the University of Lille and Clinician at the Lille University Hospital, Pr Régis Bordet is strongly invested in scientific activities and research management. 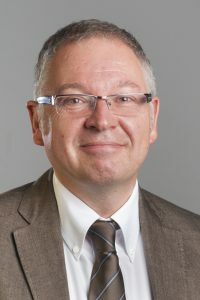 Director of the UMR-S-1171 research lab (University of Lille, inserm, CHU Lille) on cognitive disorders of vascular or neurodegenerative origin,Pr Bordet’s research is focused on neuropharmacology, studying the effects of drugs on the brain and the patient behaviour. From 2010 to 2016, he has coordinated the European Consortium Pharma-Cog (IMI Project). He has also managed the CeNGEPS (Centre National de Gestion des Essais de Produits de Santé), a Public Interest Partnership (GIP) dedicated to develop therapeutical trials (2011-2015) . 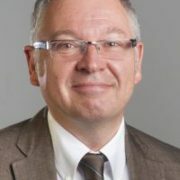 Vice-president “Research” of the University of Lille 2 – “Law & Health” until december 2017, he is since vice-president “Strategy and prospective” of the University of Lille. He is from july 2018, General Director of the Fundation I-SITE UNLE.